Lately I've been really enjoying the food reviews done by Becky Grunewald at Midtown Monthly. She has written a couple of times about Lalo's in South Sacramento. 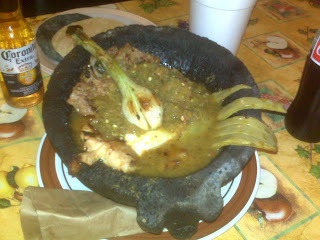 The reviews stated how they served really authentic Mexican food, even down to goat, tongue, tripe, and cactus. Some of the dishes sounded interesting, but I was a little gun-shy to go down there. Often times I want to try new things, but am afraid to spend the money when there's a chance that I might not like it and then I've wasted money. So I sent Paul. LOL. I told Epicureans Paul to go check it out and see if it would be good for his group. The great thing about his group is that he arranges with the restaurants to get a set price for a variety of dishes. So, for instance, when we went to the Peruvian restaurant, we got to try a ceviche and tripe dishes that I would never have ordered on my own. Sure enough, Paul loved Lalo's and set up a dinner for us for a great price of only $14. Our meal deal was all-you-can-eat with a buffet line. First we were able to make tacos with either barbacoa or al pastor. 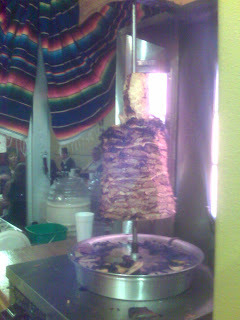 The al pastor was done just like I had it on the streets of Puerto Vallarta. The pork is layered onto an upright barbecue spit similar to the kind for gyros and schwarmas. At the top of the meat the skewer also goes through a pineapple. When you get it at a street vendor's, they cut the meat and then cut a little slice of pineapple to put in your taco as well. Here at Lalo's, they cut little pieces of the pineapple and mixed it in with the sliced meat. You got to top your tacos with onion, cilantro, and your choice of red or green salsa. They also had laid out a selection of quesadillas. Their version wasn't the type we Americans are used to - large tortillas sandwiched with cheese and meat. Lalo's were small little turnovers with flaky corn pastry dough and deep fried. We were given four varieties: mushroom, chicken, chicharron, and squash flowers. I tried the chicharron and the one with squash blossoms. The latter was interesting - kind of stringy from the blossoms which overpowered the flavoring of the cheese. I was not a big fan of this style of quesadilla. Guess on that I prefer the Americanized version. The specialty dish that we tried was the molcajate - a giant stone mortar filled with green chile sauce, beef, chorizo, onions, nopalitos, and Oaxaca cheese. It was served with fresh tortillas. This dish came to the table boiling hot. It had a bit of a spicy kick as well so that I was smacking my lips while downing my soda. I did find it very salty, though. Luckily we had the other dishes to counter the saltiness of this dish. My table companion, Dave, visits Lalo's on a regular basis and highly recommended the consomme made from the lamb they prepare only on the weekends. I love lamb and so I might just have to come and get some. The important thing to remember about Lalo's is that you are going to get authentic food as if you were in the village down in Mexico. It's one of those cases where you know it's really authentic because it's filled with natives. So, if you aren't an adventurous eater, you better stick to Americanized Mexican fare that appeals to the masses, such as Ernesto's and Vallejo's.